Zombie Apocalypse edition of our Berserker Ninja Warrior Sword with bright green cord wrapping. An awesome and aggressive sword design, this piece is begging to be picked up! 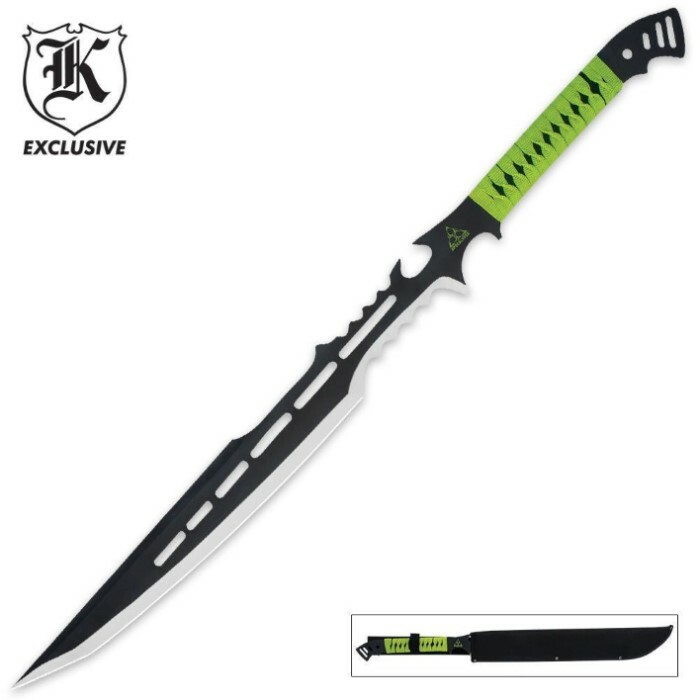 Forged from a solid piece of stainless steel, the blade is overloaded with details including futuristic cut outs, deep teeth-like serrations, tanto point and two-tone finish. The handle is wrapped in samurai style with green nylon. A black nylon sheath with belt loop is included. 28 in. overall. This was my first order from Budk in August. I bought it on BOGO and have never regretted it. We have been slicing water bottles in half since August and I still haven't had to sharpen either sword yet. I purchased this during the BOGO sale and it is one of the better purchases I have made. These are short, but fantastic. They look great and are very sharp out of the box. Purchased as a BOGO sale. Purchased it as a reward for hard work for one of my scouts. He loves it and of course his brother scouts do also! Planning on putting slings on both of the sheaths to carry on his back. Great sword!! Good purchase for when the sh*t hits the fan!! Great Sword, So Glad I Bought It! Super Great sword, came somewhat dull but extremely fun and good looking. It does bear a "Striking" Resemblance to the Red guardian sword, but i love it anyway. 5/5. ok so let me explain myself for the mediocre rating. the blade is somewhat sharp. The sword came in a little bit dirty but you can just wipe off whatever it is on the blade. the handle is poorly wrapped. the sword is weighted nicely but due to the holes in the blade it will make the sword itself very fragile. this sword should be used for nothing else but a show sword, if used for any "real-time combat situations" such as a sword fight. the blade will very likely break at the finger guard. so i give three stars because it is a very beautiful sword in and of itself but that is all it should be. Great Weapon comes sharp and ready to go. solid full tang construction lends strengthen and durability to the sword. only down side is because of the beautiful fantasy cutouts it has a tendency to catch on the sheath. it's also sharp enough to cut right through the sheath if slammed home after some heavy zombie beheadings! Fantastic product! Comes pretty sharp, very sturdy, looks great! Its a little bit smaller than it looks in the picture though. Otherwise quite a great product!